Createspace Independent Publishing Platform, 9781470155117, 192pp. It began as another newspaper assignment, a celebrity profile of the children's television icon. But in Fred Rogers, Texas journalist Tim Madigan found more than a fascinating subject. From their first meeting in 1995, at Rogers' invitation, the two became unlikely friends, a deep and abiding relationship that lasted until Rogers' death in 2003.In that time, Madigan found Rogers to be much more than the calm and compassionate personality of television. He was a person of unique human greatness who embodied love, compassion and wisdom his every waking moment. 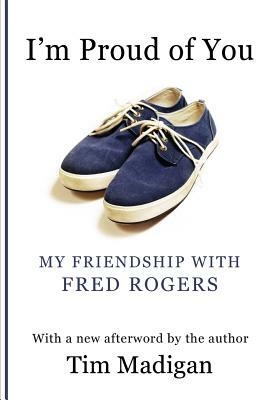 He was the transcendent being who guided Madigan through periods of life-threatening depression and the tragic death of a sibling and helped him heal his difficult relationship with his father.I'm Proud of You reveals Fred Rogers as a person who deserves a place among history's greatest people. It chronicles male friendship at its finest and most powerful. And it is a book that has already brought hope and inspiration to many thousands of its readers. With this second edition, including a new afterword by the author, the inspiration continues. "Fred comes to life in I'm Proud of You, with his simple goodness etched on every page, and his complicated greatness etched in the heart of every reader who finishes the book and decides to become a better person. "-Tom Junod, writer at large for Esquire"A loving testament to the power of friendship and to a most remarkable man." --The Boston Sunday Globe"I'm Proud of You will connect with the same audience that loved Mitch Albom's Tuesdays with Morrie and its celebration of male mentoring and friendship." - USA Today"A poignant, inspiring account..." - Minneapolis Star-Tribune. Tim Madigan is an award-winning newspaper journalist and the author of two critically acclaimed books; See No Evil: Blind Devotion and Bloodshed in David Koresh's Holy War and The Burning: Massacre, Destruction, and the Tulsa Race Riot of 1921. He lives in Arlington, Texas.